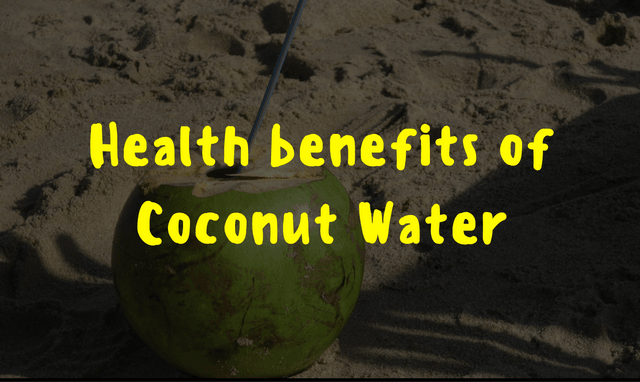 Health benefits of Coconut Water - Why should you drink this wonder! We often have this saying looping across our minds when we think about ways to keep us fit in terms of our health. Health comes almost before everything in our lives. If we are not healthy, or we are pushing our health to accomplish things, we might as well forget it. Because once your health starts breaking down gradually with neglect, you will find yourself unable to carry out even normal things that you do on a daily basis. Talking about health, there are three things which are considered. Number one is eating a balanced diet replete with the necessary nutrients the body needs. Secondly, maintaining a healthy lifestyle. Getting up early, eating at the right time, getting adequate sleep, exercising regularly and the like are what you can start with. Thirdly, drinking adequate amount of water regularly every day and this is the most important of all. Our body consists of seventy percent of water and hence, keeping ourselves properly hydrated is of utmost importance. Why Consider Drinking Coconut Water? There are various other drinks such as fruit juices, electrolyte drinks, health drinks and such which can also be good substitutes once in a while. Coconut water is one of the oldest tropical natural beverages that have amazing health benefits. It comes from young green coconuts, is refreshing and delicious and is low in calories as well. It consists of micronutrients that help boost the immune system as well. Here are fifteen health benefits of coconut water to give you an insight to this natural hydrating wonder. Beat summer heat with coconut water. Coconut water acts as a great thirst quencher after water. It can cure dehydration caused by vomiting, diarrhea, heat strokes etc. It also boosts your energy level since it is a great source of carbohydrates. Coconut water can also be consumed to rehydrate the body especially after intense work outs and exercise. Since it is very low in calories and mainly water, it will not aid in weight gain. It also helps soothe the stomach during cases like indigestion, gastroenteritis and acidity. Coconut water is great for controlling blood pressure because of its vitamin C, magnesium and potassium content. Potassium helps in lowering blood pressure since it balances out the side effects of sodium. It also helps control hypertension and serves as a good heart tonic. It is free from cholesterol and fat, hence providing with cardio-protective benefits. Drinking coconut water improves blood circulation and lowers the risk of heart attacks and strokes. Coconut water is considered to be the perfect beverage that promotes weight loss. Most importantly, it is very low in calories and is mild and hence easy on the stomach. It also has various bioactive enzymes that helps in digestion and hence increase fat metabolism. Often, high sodium intake can aid in weight gain because of water retention in the body. Coconut water contains potassium which helps in balancing out sodium and in turn flushes out excess water and harmful toxins from the body. However, do not drink coconut water in excessive amounts. It may contain very less calories but excessive intake will add to your calorie intake. Most headaches are caused by dehydration, even migraines. People with migraines have less magnesium levels in their bodies. Coconut water supplies electrolytes thereby hydrating the body more and also is rich in magnesium, hence reducing migraines. It is also a natural remedy to treat hangovers because of its rehydrating powers. Alcohol robs our bodies of hydration which coconut water can help replenish. Amino acids and dietary fiber in coconut water helps regulate blood sugar and also boost up the insulin sensitivity of the body. It also helps diabetic people manage weight. Mature coconut water can help decrease the level of glucose in blood and oxidative stress. Coconut water is a natural diuretic, promotes urine flow and helps get rid of toxins from the body. It is abundant in potassium and alkalizes urine which reduces the risk of developing kidney stones that cause pain and results in serious health issues very often. However, if you have high potassium levels in your body, avoid drinking coconut water. Coconut water prevents ageing because it consists of cytokines. It also helps reduce the risk of having age related diseases because it regenerates cells and tissues. Coconut water is rich in manganese which helps break down carbohydrates and fats into energy. Hence drinking coconut water improves metabolism and also helps boost it, hence, aiding in burning more calories. It also helps greatly in digestion because it contains high amounts of fiber which helps the digestive system function properly. Muscle cramps can be caused by various factors which can be intensely painful for you. Drinking coconut water can help ease the discomfort from muscle cramps. They are mainly caused by potassium deficiency. Coconut water being a rich source of potassium can provide relieve from muscle cramps and also replenish electrolytes in body if muscle cramping is caused by excessive and intense exercising. Bone strength is extremely important for the body. Weak bones can cause innumerable health problems and pain. Even though, calcium is the main constituent of bones, there are also various other nutrients which are required to keep our bones healthy and strong. Coconut water has a great impact on bones and promotes bone strength because it has calcium and also magnesium which aids in building up bone strength. A diabetic patient is unfortunately debarred from consuming sugar and sweet. However, a sweet and refreshing glass of fresh coconut water will not only fulfil their sweet cravings but also help with the disease. Studies have revealed that coconut water has an anti-diabetic effect because it helps regulate blood sugar and also prevents the occurrence of blood clots, something which diabetics are very susceptible to. Coconut water consists of the five electrolytes which are essential for the human body. They include calcium, magnesium, phosphorus, potassium and sodium. These nutrients have various properties which cater to different functions in the body. As for instance, calcium helps in bone building, magnesium helps prevent diabetes, asthma etc, potassium helps the better functioning of the nervous system and the brain and also has various other functions as well and the like. It also consists of copper which promotes better metabolism. Apart from various internal health benefits, coconut water has various skin and beauty benefits as well. Because of its great rehydrating properties, coconut water hydrates the skin hence acting as a moisturizer and keeping it soft. Skin can be dehydrated very easily. Harsh soaps, too much exposure to sunlight and pollution are factors that strip your skin of its natural moisture. Hydrate your skin by applying coconut water, lemon juice and if required, honey on your skin every other day to keep it moisturized properly. Skin is very sensitive to bacteria and fungi which can result in infections such as rashes and skin irritations. Coconut water has great antibacterial, anti-parasitic and antifungal properties that helps reduce the symptoms and hence cure the infection. Apply coconut water on the infected area. It also helps soothe the irritating effects of the infections. In the same way, coconut water can help reduce acne as well because of its antibacterial properties. You can make a coconut and honey toner and apply it every day on the affected areas. Your acne will disappear in no time. It is commonly said that the state of your hair reflects your health. If you have a healthy growth of hair, then you are a healthy person. However, hair loss is the nightmare of majority of the masses. This is caused by the lack of certain nutrients which causes hair to fall or stunt the growth of hair. Coconut water being abundant in nutrients helps in hair growth greatly. Massage coconut water every alternate day on your scalp so that gradually, you have a healthy growth of hair which you can be proud of. Because of its hydrating properties, coconut water also helps boost the shine of your hair. Apply coconut water to your hair and then thoroughly rinse to have bouncier and glossier hair. Coconut water is a wonder beverage. It has an overwhelming number of great properties that boosts up the health and also prevents various diseases. However, care should be taken while consuming coconut water as everything has its cons. If you are allergic to nuts, you should consult your physician if you can consume coconut water or not. There are also various health related issues that might prevent you from drinking coconut water. These are a bunch of health benefits. Make me love coconut water more. And envy more the people who easily find one and can drink fresh coconut water. Thanks Jane for this wonderful post!